Returning this month is Hugh Jackman’s The Front Runner (production code: TFR), a film about Senator Gary Hart’s 1988 presidential campaign. Production set up on October 3rd on Delta Air Lines‘ sprawling campus. The next day, it moved out to Stone Mountain Park. Filming would continue there until October 9. On the 10th and 11th, crews were in downtown Atlanta at the Hotel Indigo. The next Saturday, everything moved up into Midtown. Between October 15 and 17, filming took place near Perimeter Mall. On the 17th, the movie was back in Stone Mountain, and most recently was spotted in Norcross. The Front Runner also stars Vera Farmiga, Molly Ephraim, J.K. Simmons, Mike Judge, and Toby Huss. Ralph Macchio and William Zabka are set to reprise their roles from The Karate Kid in a new series, Cobra Kai (CK), which is being produced for YouTube Red. The show will follow a new generation, led by Jacob Bertrand and Gianni Decenzo, with Macchio and Zabka taking a back seat. Cobra Kai filmed in Union City on October 10 and at Emory’s Briarcliff campus on the 12th. More signs were spotted on October 14 in Marietta off of Paper Mill Road, where crews filmed at a private residence. Brockmire (WTM) was also spotted in Atlanta. The Hank Azaria/Amanda Peet series is currently working on its third season. On October 1, filming took place downtown near Georgia State University with a basecamp was set up on Decatur Street. October 4 brought crews to Conyers. Signs were spotted on Edgewood Avenue on the 7th, and again in Conyers between October 8 and 9. Scenes were filmed near Oakland Cemetery on the 14th, and once again in Conyers the next day. Crews moved next to Atlantic Station, and most recently, to Buckhead on October 23. New this month is the Eli Roth-directed The House with a Clock in its Walls (BVP) starring Jack Black, Cate Blanchett, and Kyle MacLachlan. It will tell the story of a young orphan assisting his uncle in locating a mysterious clock that has the power to end the world. The film shot at the Briarcliff Mansion on October 10. On the 12th, production moved to the Fernbank Museum of Natural History. 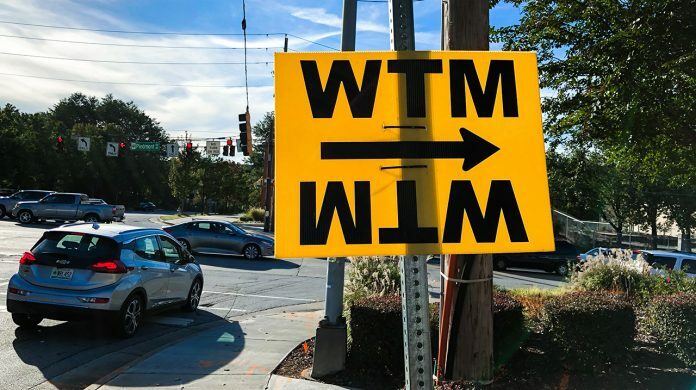 More signs were spotted on the 17th leading to Emory, and the movie shot in downtown Newnan on October 20 and 22. Another newbie is Boy, Erased (UFI), starring Nicole Kidman, Russell Crowe, and Joel Edgerton. The film focuses on the son of a Baptist preacher who is forced to participate in gay conversion therapy. After ending September in Morrow, Boy, Erased filmed at Delta Air Lines’ headquarters, using the Delta Tech Building. Between October 8 and 11, a basecamp was set up off of US-78 and Paxton Drive Southwest in Lilburn. On the 17th, production moved to Decatur. Donald Glover’s Atlanta (MiniM) shot more of its second season this month as well. The FX series had signs up on Cleveland Avenue near the airport on September 30. The next day, crews were in College Park. More signs were plopped along Joseph E. Boone Boulevard on the 6th and in Vinings on the 11th. Marvel’s Ant-Man and the Wasp (ML) continued into October as well. The Paul Rudd/Evangeline Lilly/Michael Douglas superhero flick was downtown at 200 Peachtree Street at the end of September until the 4th. More recently, signs were spotted in Chattahoochee Hills on the 20th, and in Newnan until October 22. Making things more confusing, Black Panther (ML) reshot in the Serenbe area on October 15. As you can see, both used the same code. Hap and Leonard (H&L), now filming its third season, had signs up on Roswell Road at the end of September. On October 2, production moved to Villa Rica. A basecamp in Covington on the 4th was spotted at the Church at Covington. More filming took place in Porterdale on October 16. On the 20th, crews moved to Chattahoochee Hills. Most recently, this show has filmed in Newnan. A new crime drama for NBC, Good Girls (GOOD GIRLS) is currently in production. Staring Christiana Hendricks, Retta, and Mae Whitman as three suburban women who decide to rob a supermarket, the show focuses on the aftermath of the robbery when everything, of course, spirals out of control. Good Girls was seen in Decatur on October 5. Signs were placed in Sandy Springs at Glenridge Drive and High Point Road on the 12th. Between the 15th and 18th, crews shot in Tucker. Most recently, signs were placed along Ponce De Leon Avenue in Poncey-Highland. Another new series this month is TruTV’s Misfits & Monsters (M&M) created by comedian Bobcat Goldthwait. The show will be an anthology series, using different genres to tell stories satirizing our modern world. On September 29, the show filmed in Mableton. Signs were spotted on Peachtree Dunwoody Road at I-285 between October 3 and 5. From the 9th to the 11th, a basecamp was set up at the Temple Kol Emeth in East Cobb. More recently, filming took place in Buckhead on the 22nd. The CW’s Black Lightning (LOC), a new series about a retired superhero returning to the world of vigilantism, shot near the Fox Theatre on October 19. The show stars Cress Williams, Nafessa Williams, and China Anne McClain. And Trial By Fire (VERITAS), a new film, filmed near SunTrust park on the 10th. The movie, which stars Jack O’Connell and Laura Dern, follows the true story of Cameron Todd Willingham, a Texas man who executed after scientific evidence and expert testimony about his case was suppressed. Scream (SS3)’s third season shot into October as well. The show ended September at the Douglas County High School in Douglasville. It moved to Villa Rica on the 2nd, and filmed in Poncey-Highland between October 14 and 16. On October 18, the show returned to Douglasville. Also this month, the FOX series Star (SOS) set up a basecamp in Marietta at Hillgrove High School on September 30. They also shot in Midtown on October 11. The one-two punch of Avengers: Infinity War (FIGARO) and its yet-to-be-titled follow-up was seen in Norcross on the 10th, and signs were placed in Peachtree City between the 18th and 19th. The X-Men inspired series, The Gifted (HVN) was in Fayetteville on October 13 and near Jimmy Carter Boulevard on the 19th. CBS’s MacGyver (EYE) shot in Midtown in early October. This past week, signs were spotted in Forest Park between the 21st and 22nd and in Adair Park off Lee Street the next day. Dynasty (CROSS-EYE) was spotted on October 20 in Duluth. Kevin Hart’s Night School (GED) mocked up a “Christian Chicken” restaurant on Fulton Industrial Boulevard in late September. BET’s The Quad (GAMU) shot at the Gold Room on October 25. Step Up: High Water (SUP) was in Conyers on October 17. The Walking Dead (SF)’s signs were seen in Senoia on the 15th. The Resident (TR) shot in Midtown near the High Museum of Art on the 2nd, and had a basecamp in Canton at Blankets Creek on the 10th. Finally this month, Netflix has announced that season two of its brand new series Mindhunter will focus on the Atlanta Child Murders of 1979-1981. There’s currently no word whether or not that means the show will shoot down here. Season one shot in Pittsburgh, which is another heavily subsidized and popular filming destination. However, since Netflix has dug in its heels here in the south (Ozark, Stranger Things, plus a slew of original movies), we can’t help but wonder if the David Fincher show will travel down to capture some authentic scenery.